I imagine we all need quick meals and quick meals that are welcomed by the seven-year-old are all the better. But come to think of it, he loves most of our quick meals and was delighted with scrambled eggs and pan-fried cauliflower the other night as with another quick stand-by Pasta Carbonara. In any case, I made fried rice for a weekly gathering last week and was reminded just how adaptable, good, and easy and quick it is. The only thing you need to have thought of in advance is the rice. I always make more rice than I need at any given time and then freeze the rest for the fried rice nights. Or make it in the morning and leave it sitting out all day and then you’ll have nicely dried out rice for the fried rice that evening. And, if you want regular inspiration for cooking tasty and creative dishes on a regular basis you might subscribe to my Seasonal Recipe Collection or give a subscription as a gift this season–a gift that does not create more clutter but instead good smells and happy tummies for a year! Signing up just takes a minute and then you have access to 550 recipes and tips and pages about each vegetable and so much more. You can use most any vegetable you have on hand–though watery ones like zucchini and tomatoes are less well suited. Heat the oil in a wok or large skillet. When hot add the ginger, white part of green onions, garlic, carrots and chili (if using) and stir to coat with oil. Cook on high heat for about 2 minutes, stirring often so prevent the garlic from burning. Add the rice and make sure to break it up well before you put it in the pan if it’s in big clumps. Stir well to coat the rice with the oil and vegetables and cook, stirring often for a few minute to heat the rice through and get it a bit crisp. 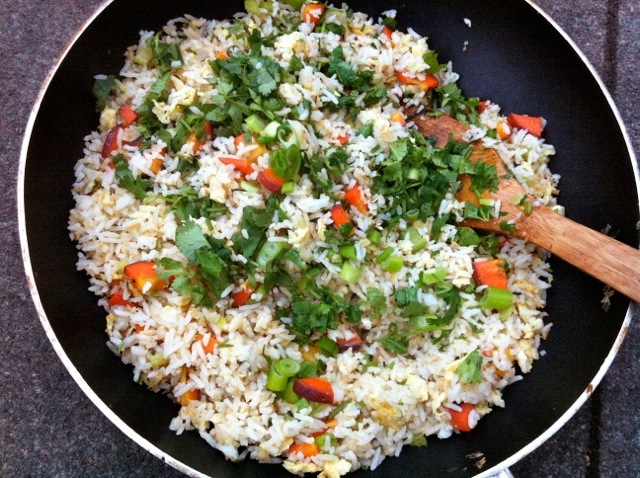 Move the rice to one side of the pan and add a little more oil and then add the beaten eggs. Scramble them and then mix them into the rice. Add the soy and fish sauce, if using, the green part of the onions and the cilantro. Cook for another minute or two and then taste for seasoning and serve. What to do with 1/3 Can of Coconut Milk?